When it comes to finding the perfect ring, you have a number of options and usually the bigger you go, the bigger the price tag. The two main components, the cut and setting are a key feature that can glamor and give the illusion of a much larger stone so that you can save some money. 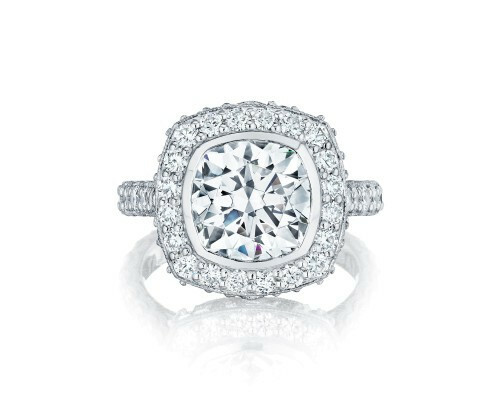 For the most brilliant shimmer, you’ll want to consider a round cut diamond placed in a halo cushion setting. We’ve put together this list of round diamond in cushion halo settings, so you can see just how magnificent this pairing can be! 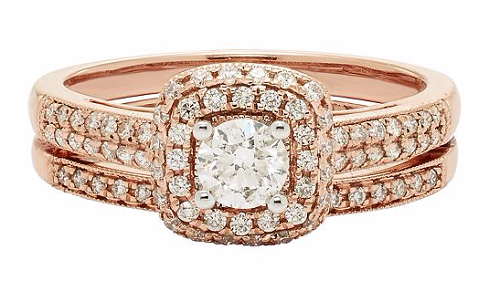 The rose gold really adds a lovely romantic touch to a rather traditional ring. The total carats of this ring is just over .3 carats, but it definitely does not give off that appearance. With a crisp round cut diamond cushion in a bed of tiny stud, you get a glamorous design without the glamorous price tag. This stunning ring is sure to get a lot of attention. Not only will it provide you with exceptional sparkle and shine from the additional diamonds featured on the 18K white gold band, but the unique twist in the setting also makes this ring stand out. This simple rings may be small, but it is the perfect fit for the more modest soon-to-be bride. 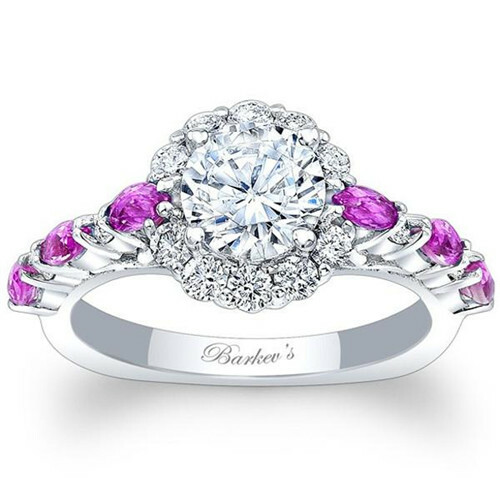 It features a perfect cut round diamond in a 14K white gold cushion halo setting, and the additional details on the band is what makes truly one of a kind. 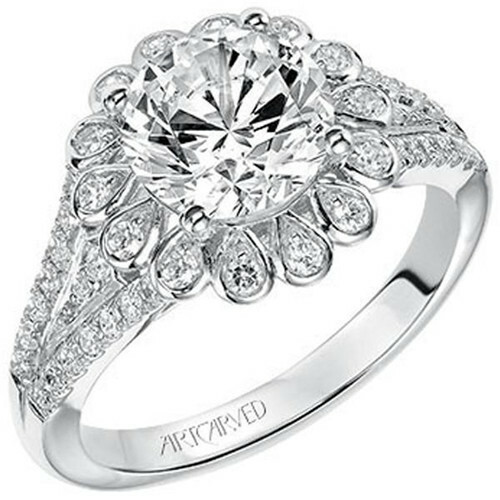 The design of the ring will absolutely get some attention with its unique flower inspired cushion halo setting. 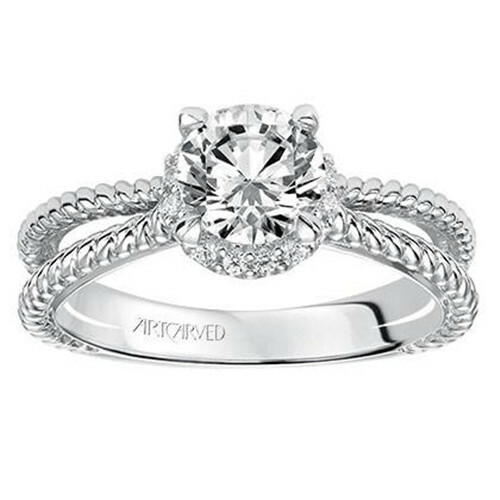 The split band adds an additional element that gives this ring a much larger impression that is simply magnificent. Double halo settings are ideal for creating not just a larger impression but more depth to the visual appeal. The two toned setting of this round diamond in cushion halo ring may only feature a small center stone but with the additional layer of pink and white diamonds, you never take notice to the smaller center stone. This ring is a truly glamorous option for those who want a whole lot of sparkle in a classic design, the triple white diamond studded band ensures that this ring will shine at every angle. Paired with the cushion halo setting, this ring is ideal for those who want a beautifully refined look. 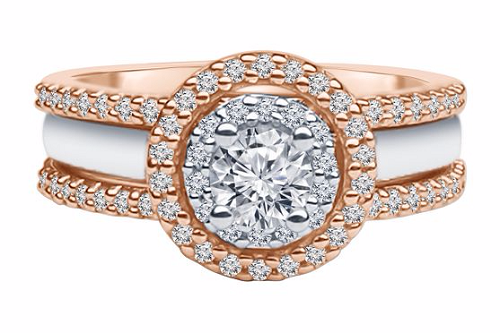 The rose gold halo setting and band give this dazzling ring a vintage effect, perfect for those who want a timeless ring. 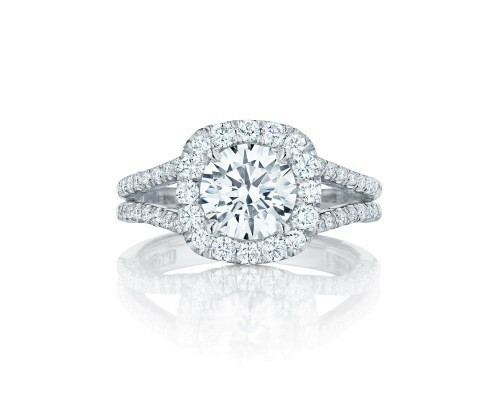 Featuring a 1/3 carat center round cut diamond and 87 additional smaller round cut diamonds, this ring is sure to shine from every angle. 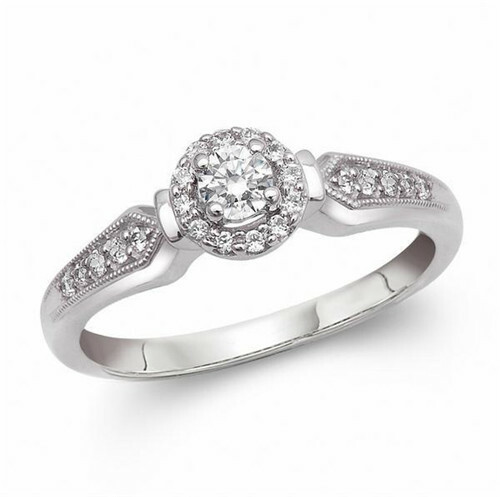 This dainty diamond encrusted ring may be simple and small, but it gives off a lot of shimmer and sparkle. Paired with the matching thin diamond accented wedding band, you’ll have a magnificent engagement/wedding band set that is chic and timeless. While the halo setting will instantly make any diamond look larger, 3 brilliant round cut diamonds with each in their own halo setting look much shining. The brilliance of this ring is enhanced even more with the 14 Karat yellow gold band. 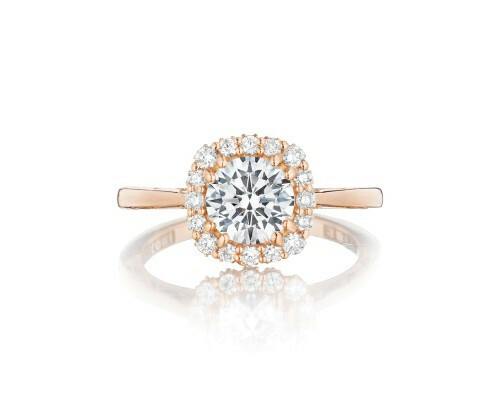 This is the perfect ring is incredibly romantic and girlish. 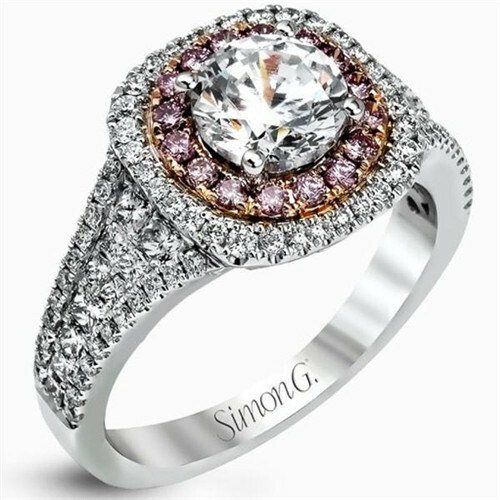 The eye-catching pink sapphires perfectly accent the 1 carat round cut center stone, giving this ring incredibly glamorous appeal. 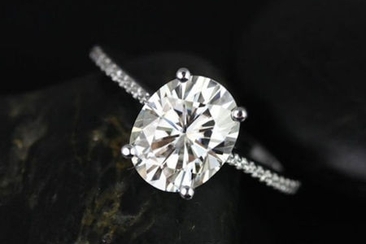 The simple swirl design of this round diamond in cushion halo ring makes it elegant and unique. The swirl design ensures that the perfect round cut diamond beautifully reflects the light from every direction to give off a spectacular array of light. 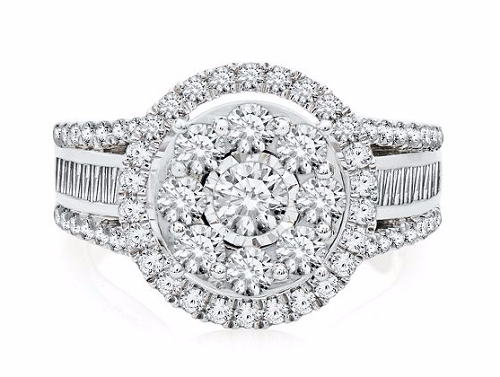 The center brilliant cut stone is enhanced by the additional sparkle and shine of the pave set diamonds along the band. This is a classic ring that is perfect for all types of brides to be! This 1/3 Karat center round cut diamond is surrounded by a dazzling display of white diamond accents. The double halo of white and rose gold makes this the ideal choice for anyone wanting something tradition with a bit of a modern twist. The elaborate details of this ring really add to the beauty and style. 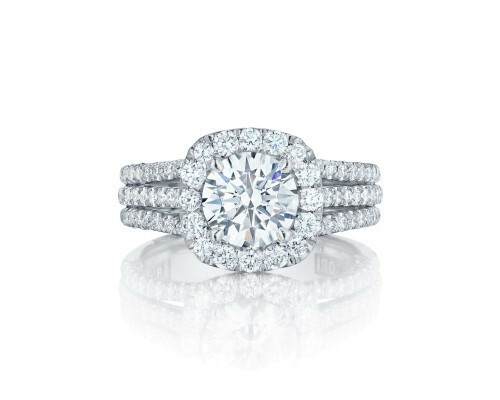 While the center stone may be small, it looks absolutely gorgeous on top of the halo setting and 18 Karat hand carved white gold band. This ring truly shows just how much larger a perfectly cut round diamond in cushion halo setting can appear. 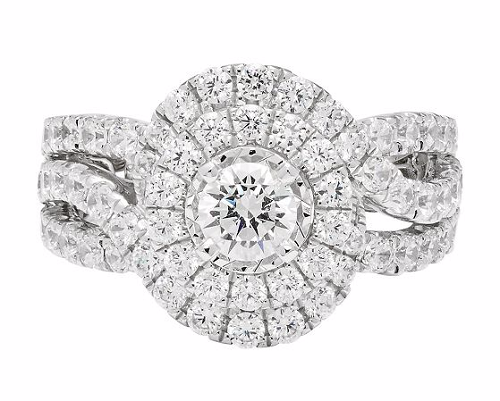 The size of the center stone looks twice as large surrounding by a bed of white diamonds and a band featuring white diamond accents on all sides. At first glance, this ring looks as though it features a breathtaking large diamond stone, but the center stone is only close to ¼ carat in weight. It gets its much larger look thanks to the surround white diamonds that really makes this ring look brilliant and beautiful. 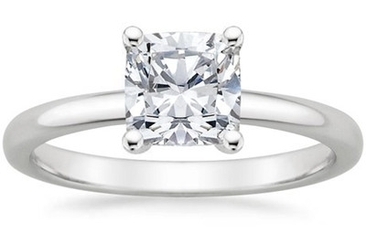 While this ring may look simple, it is anything but! 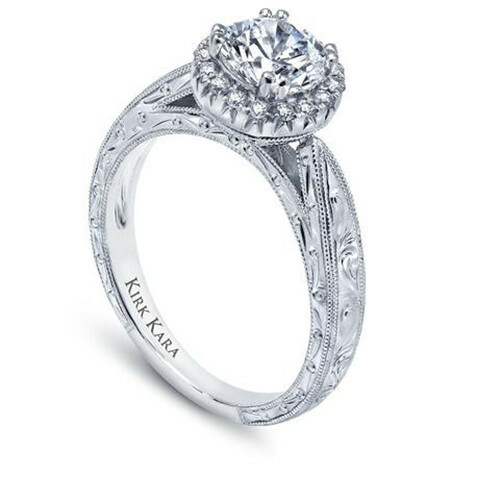 The center stone is surrounded by a bed of 1/8 carat round cut diamonds that takes this simple ring to a whole new level. The split band adds a touch of modern style with its ripped lines for a unique finishing touch. 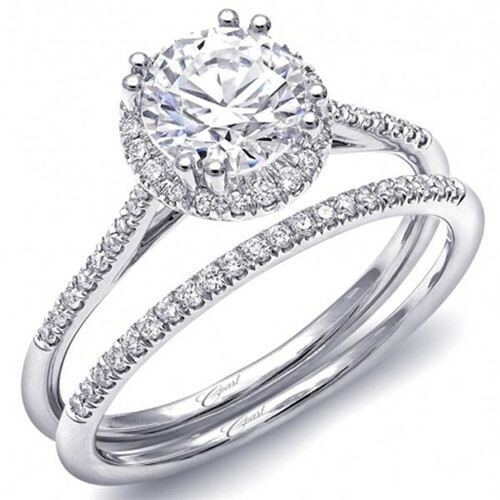 This ring is a traditional example of the classic halo setting with a brilliant round cut diamond. 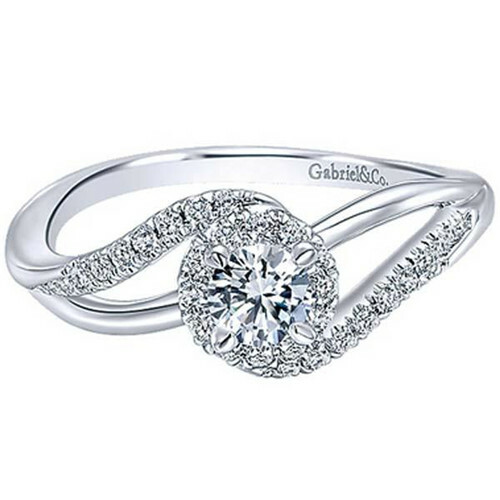 This beautiful ring takes away all the bells and whistle to really allow the center stone to shine and sparkle. 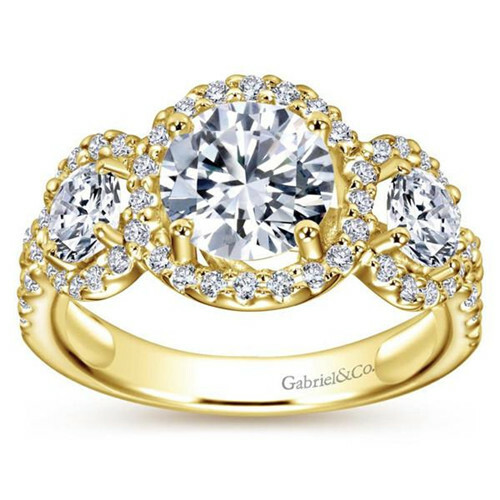 Unlike the previous ring, this one is anything but stunning. The ½ carat center round cut diamond in cushion halo setting is surrounded by 62 brilliant cut round diamonds. 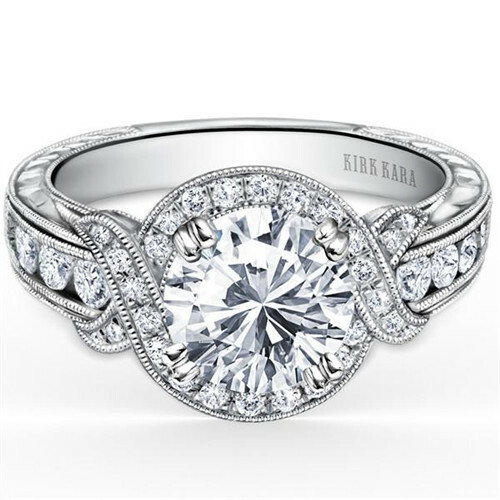 This is one ring that is sure to get a lot of attention for its sparkle and over the top look. 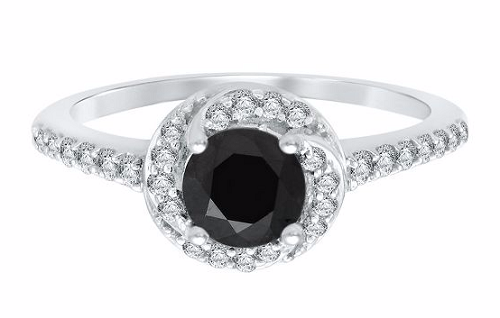 We round off or spectacular list of round diamond in cushion halo setting with a classic black and white inspired design. This ring may not be the traditional engagement ring with its ¾ carat round cut black diamond, but it is the perfect choice for those who want a classic look that perfectly fits your personal style. 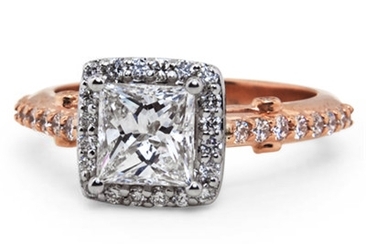 Are you looking for cushion cut engagement rings? Take a glance at our gorgeous collection, you know it’s the right place. 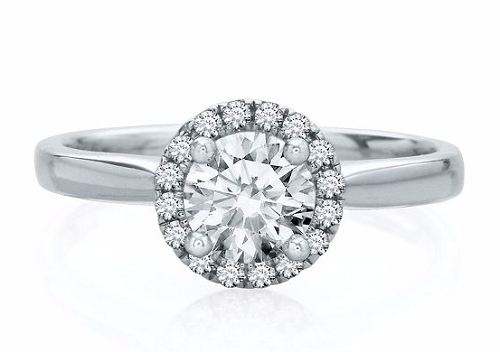 A closer look to a previously-overlooked style: oval engagement rings! With their royal shape and elegance, they are making a great comeback. 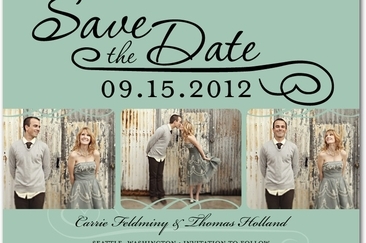 Check our gorgeous selection! The perfect ring will have the perfect cut diamond displayed on the perfect setting and the princess cut halo setting is, simply, perfect! This article shows you why you’ll want to consider the cut setting combo. 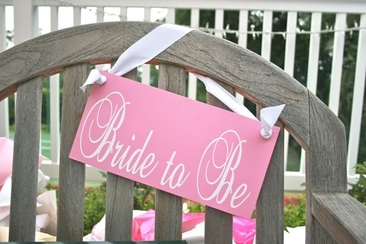 A successful bridal shower party comes with some bridal shower etiquettes. From hosting the party till opening the gifts, each step has some etiquettes. Learn to get prepared! When going for a bridal appointment, you should know what to wear when trying on wedding dress to have a more comfortable and fruitful shopping experience. Check out the answer! Server responsed at: 04/21/2019 11:08 p.m.